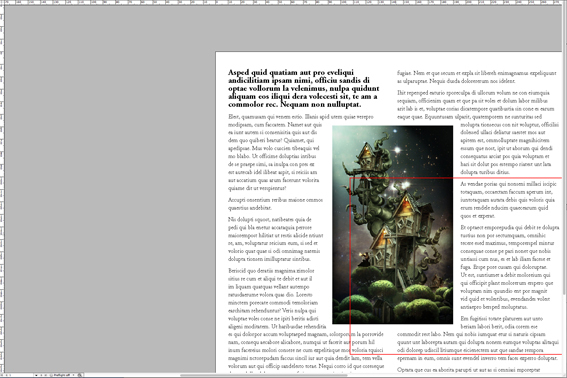 InDesign tip : #14 talked about different ways of zooming about an InDesign document. but it missed one really cool little trick which has, apparently, been with us since CS4 — when the navigator panel was dropped — and it’s called, impressively, power zoom. • if the text tool is active in a text frame — use option only. why the developers insisted on making it this complicated is a mystery. incidentally, if you like that groovy little image by dek wid, you can find a tutorial showing how it’s done over at photoshop tutorials. lovers of typography love a well designed ligature. those who are indifferent to typography generally say “what’s a ligature?”. and those who are entirely ignorant don’t even notice a ligature even when they are looking straight at one. although, that’s actually the point of the ligature in the first place — you’re not supposed to notice the typographic trick, because the ligature is intended to make reading easier. that’s right, ligatures are those little joined-together thingies that are generated by default in InDesign. unfortunately, ligatures do not always lead to improved readability and sometimes you’re better off just using the standard letterforms. you can turn ligatures off in the dropdown menu in the character panel. if you’re doing the right thing and using styles for your text formatting, you’ll find ligatures as one of the options under basic character formats. you can set no-ligatures as your default for all future documents by unchecking it in the character panel when you have no documents open. 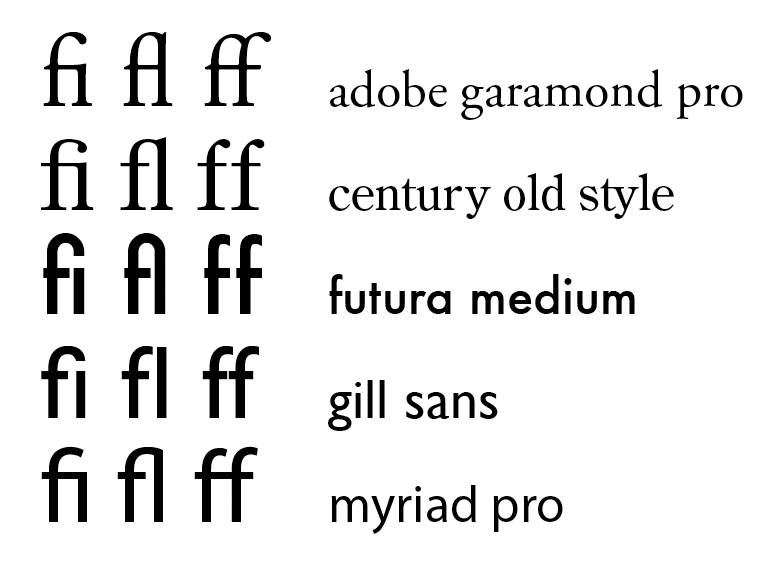 of course, the Adobe CS being what it is, you do NOT turn ligatures off in Illustrator the same way you do in InDesign. for Illustrator you have to go to the opentype panel instead. the only drawback of that method is that if you decide to change the tab later on, you also have to remember to change the two indents to match. the indent to here character looks a bit like a sword (or a cross, if you prefer). place the character in the position where you want your paragraph to align to by using command-\. now if you decide to change the tab, the rest of the paragraph moves automatically. if you think placing a whole bunch of those little doovies in a whole bunch of paragraphs is too time-consuming, then you really should revisit tip #15.
try it — you’ll like it. 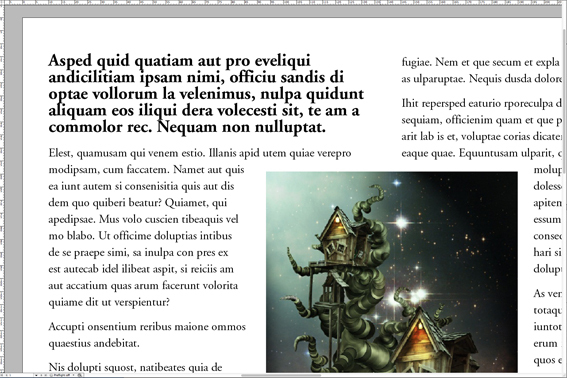 working with text in InDesign doesn’t have to be difficult. 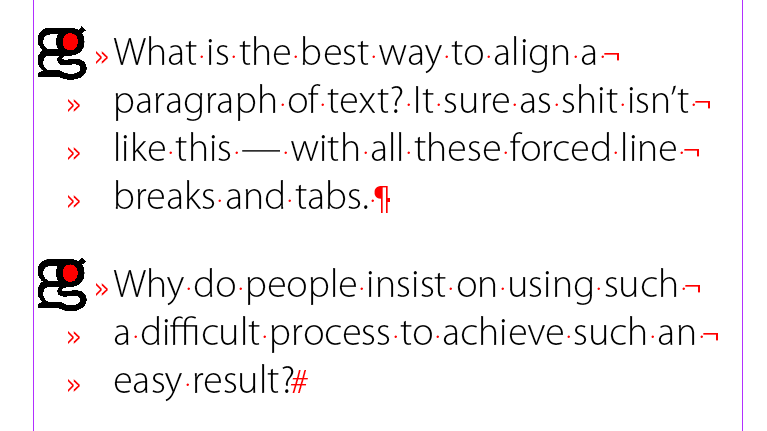 here are just a few text selection tricks. …but you probably already knew that. to select a specific portion of text — click once at the beginning of the bit you want to select (to place your cursor) and then shift-click at the end — everything in between gets selected. 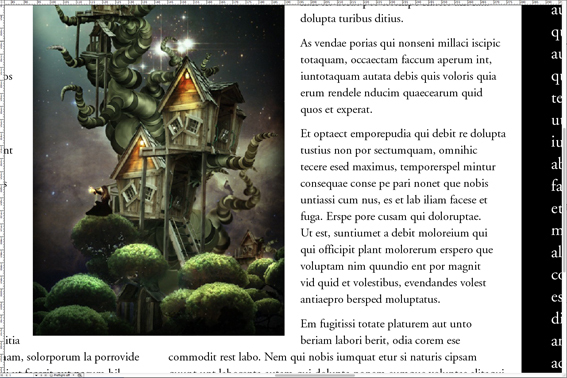 you can also navigate around and select text entirely with your keyboard. • left and right arrows take you along a line one character at a time — but hold down the command key and you’ll jump by words. • similarly, the up and down arrows move between lines of text — add the command key and you’ll jump to the beginning of the next paragraph. combine all that with keyboard shortcuts for your paragraph and character styles and you’ll be a text formatting wiz.